Some say the best advice is to not take your work home with you. Why? Well, sometimes if you're focused on work all the time, it'll start to play tricks on you all the time. Just ask Dr. Michaels, the focal character of David Rabe's Good for Otto. Receiving an intimate production with The New Group, Good for Otto is a long-winded psychological language play about a man who is haunted by his past, and by his clients. Good for Otto is a unique look at the mental health system through the lens of the a small town health clinic. Dr. Michaels has some special patients to handle including a young girl who encounters mental storms and a mother who gets headaches following the death of her son. His colleague, Evangeline Ryder has her hands full with patients of her own including a man who won't get out of bed, a man freshly out of the closet, and a man whose best friend is a hamster. David Rabe structures his three-hour tour of insanity through snapshots with each patient while simultaneously watching the moments that trigger Dr. Michaels into his own emotional journey. Through themes of death, mental stability, and the health system itself, Good for Otto has so much to process, but there's depth to it. Rabe overwrites. He includes immense amounts of physiological interludes that fit a theatrical setting, but don't connect fully. Not every character gets a fully realized arc, especially the patients who only get a brief interaction with the doctors. Yet the substance that Rabe has included has something worthy within. Perhaps a bold assertion, Good for Otto needs to be made into a television series. There is so much room to explore in each of these people that a longer format will open up this opportunity. Once we learn the stakes of the health system in the second act, Good For Otto has a stronger purpose. Rarely do you see a show where the second act is stronger than the first act. It's not until Act II of Good for Otto do the dots start to connect and the wheels truly begin to spin. With so many characters, act one is simply lengthy exposition and stylistic set up. The second act opens up a world that is much more engaging. For a stage version, perhaps Rabe needs to trim a few characters to allow the piece to skip along quicker. What should stay is the personification of the insurance company through the role of Marcy. We have all been in a position where we are talking to the faceless person on the other side of the line who will not throw us a bone no matter how hard we plead. Watching the slight tinge of emotions from Nancy Giles made you gain some sympathy for the job, but still disdain for the rules set forth. Ed Harris takes on Dr. Michaels with panache. He's subtle in his emotions but manages to bring some complexity with little backstory. Harris' shrink has a heart that beats a bit extra for those he has a close bond with. On the opposite end of the empathy spectrum is Evangeline Ryder played divinely by Amy Madigan. The extra edge to her exterior allows Evangeline to be practical, opposed to someone with a soothing bedside manner. We see how that takes a bit of a toll on patients including Barnard, played perfectly by F. Murray Abraham, and Alex. Maulik Pancholy's Alex bordered between relatable and unstable, partially due to the twist and turns in his character's narrative. Taking on Frannie's foster mom, Rhea Perlman captured the struggle and emotions of someone who wants to do anything for their loved one. Perlman gave the most genuine performance of anyone on stage. Rabe's stylistic structure for the play features a surrealistic spin that doesn't always pan out for the overall story. Dr. Michaels is haunted by his mom, who does have the power to interact with Frannie, perhaps through Dr. Michaels' imagination. As mom, Charlotte Hope took a pedestrian approach to the role. Perhaps it was the fact that the text didn't clarify her. Hope seemed to be as lost as her character as she meandered around the stage without purpose. Director Scott Elliott took Rabe's language play and focused on that. In turn, it turned the pacing into something a bit glacial. Therapy sessions tends to last upwards to an hour and Elliott took that to heart. One of the strongest directorial choices was the include an on-stage audience that was sprinkled with the cast. Doing so, scenic designer Derek McLane created a waiting room that was expansive and overwhelming. There was nothing soothing for the patients. Despite the aesthetic of the space, creating a world where the audience is present represented the stretch of more patients in need and allowed to be a cover to keep the cast around. Good for Otto teeters on the slow side, but if you can get past the pacing, there may be some substance left for you. 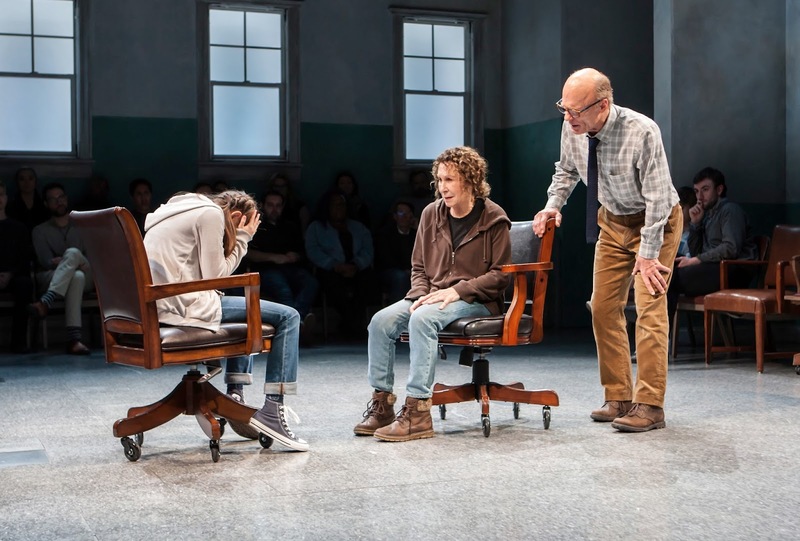 David Rabe explores an important discussion about all the sides of mental health, it's just the execution and perhaps medium were not right.